While Mario and Luigi were out collecting Coins, the Koopalings appeared and kidnapped Peach. Now the Mario Bros. must cross the Mushroom Kingdom to get her back. As well as reaching the Flagpole in each level, you also have to gather as many Coins as you can with the new Gold Flower and Gold Block items. 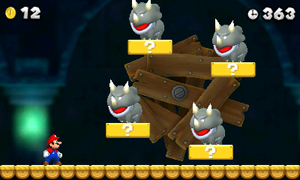 You can also take part in Coin Rush mode, where you must collect as many Coins across three random stages as you can. Share your results through StreetPass and challenge other players' scores. You can download extra level packs from the Nintendo eShop.